While I love picking up an overstuffed sandwich and taking a big bite, there are plenty of delicious sandwiches that require a fork and knife. This fancy open-faced sandwich even has a fancy name: tartine. Preheat the oven to 400 degrees. Wash and prep asparagus. Cover baking sheet with tin foil, drizzle asparagus with olive oil and season with salt and pepper. Cook for 10-12 minutes. Remove chorizo from casing and cook on the stovetop. Meanwhile poach eggs. Butter both sides of the bread and toast in the oven. 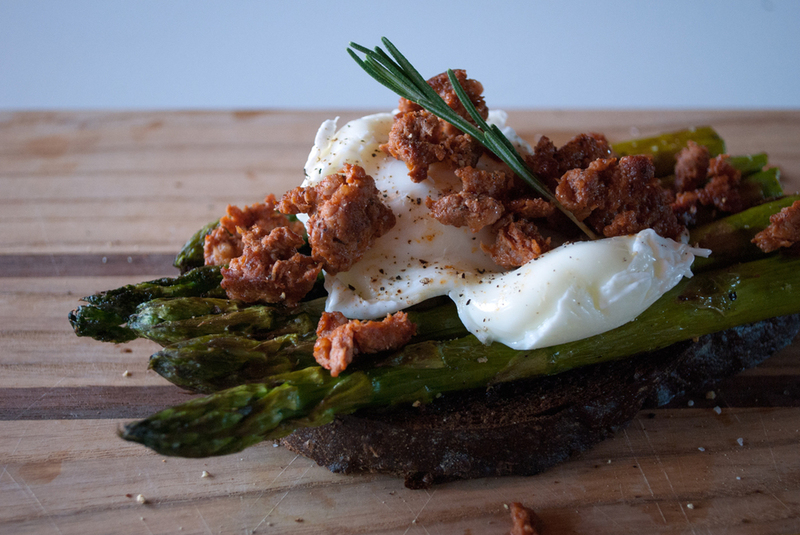 Top toast with asparagus, egg, and then chorizo. Season with salt and pepper to taste. Garnish with rosemary.